We just returned form a popular fine art festival, where we purchased a beautiful hand blown glass garden art flame. Looking at it, we knew exactly where to put it since the red color and flame shape represented the fire element. We put it in the FAME area of our garden, right next to the arbor with twinkle lights. I say that in Feng Shui there are "no random acts of decorating", everything can be placed where it can have the most benefit. 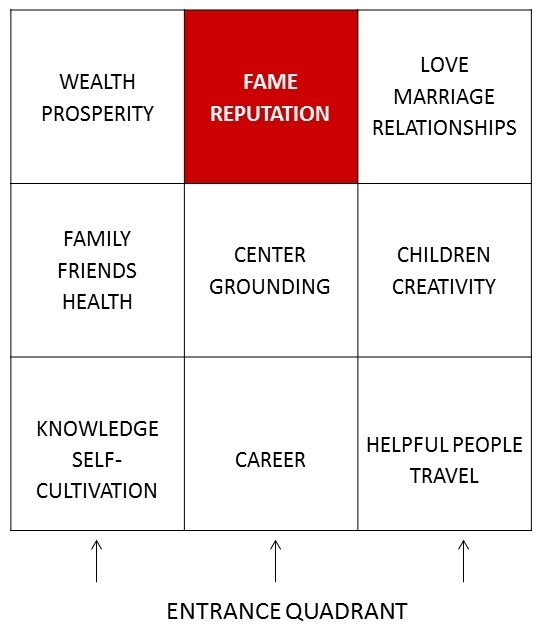 One of the Feng Shui principles is that everything is connected – So if you ask yourself: Can changes I make in my home really affect my fame and reputation? – The answer is ABSOLUTELY. So, how can the energy in your home help you bolster your positive reputation? Begin by mapping your home using the Feng Shui Bagua Map, locate the Fame and Reputation area in the back middle of your home, then use the enhancement recommendations below to begin creating magic. 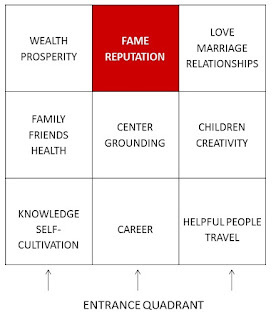 In the Feng Shui Bagua (Ba-gua) Map, represented as a grid of nine sectors, the Fame and Reputation area is located in the center back of your home/office/business. The Bagua comes from the Chinese philosophy, “The I Ching,” and literally means “eight trigrams” , with the center for grounding. In the “I Ching” the Fame and Prosperity area of your home or business is called “Clinging Fire” because one of the attributes of Fire is that it clings to whatever it is burning. Whether good or bad, our reputation is very difficult to shake off. It clings tight, either warming or burning us into the hearts and minds of others. Therefore cultivating a good reputation helps friendly relations to spring up all around us, creating the best chances for a happy and secure future. Enhancements in this area are particularly helpful if: You would like more recognition at home or at work, you want to establish a good reputation in your community, or you want to be well known for something you do. The element for this area is Fire, and the color is anything in the red spectrum. Red is one of the most powerful colors in the Chinese culture. It represents fame, fortune, joy, festivity, longevity and protection from bad luck. Representations of this element can be used inside and outside of your home or business. Of the 5 Feng Shui Elements (Water, Wood, Fire, Earth and Metal) the Wood Element feeds Fire, therefore adding representations of Wood, such as plants or items made of wood would help feed the fire of your dreams, enhancing your opportunities and achievements. Avoid the Water element in this center area, as Water extinguishes Fire. If your Fame and Reputation area is missing from your floor plan, you can anchor the area by doing one or a combination of the following cures: Anchor the missing area structurally, such as building a trellis or deck, planting flowers in a flower garden or planter boxes in the red spectrum, planting a tree with red leaves, such as an ornamental cherry tree, adding a seating arrangement with red pillows and umbrella or garden art representing stars, or celebrating figures, adding up- lighting, twinkle lights or tiki torches. If the area outside is not accessible, you can symbolically anchor from the inside by hanging a 30 mm round faceted crystal, placing a mirror, and/or a picture representing fame on the wall by the missing area. A bathroom is especially important to enhance when it is in your Fame and Reputation area. Always remember that ALL drains and toilet lids must be kept closed when not in use, to keep the flow of fame from “pouring down the drain.” Using the enhancements stated above, you can turn your bathroom into a beautiful shrine to your fame. Bring more fire to your fame area and watch your reputation grow! !